During the 1970s and again in the 1990s, the rural population rebounded in what appeared to be a reversal of urbanization. Much of the “rural” rebound was driven by suburbanization, which is the movement of people from cities to surrounding suburbs, ex-urbs, or edge cities. Suburbanization may be driven by white flight. Counterurbanization refers, broadly, to movement away from the city, which may include urban-to-rural migration and suburbanization. Counterurbanization has created shrinking cities and attempts to better control urban growth. ex-urbs: The expression exurb (for “extra-urban”) was coined by Auguste Comte Spectorsky in his 1955 book The Exurbanites to describe the ring of prosperous communities beyond the suburbs that are commuter towns for an urban area. counterurbanization: Counterurbanisation is a demographic and social process whereby people move from urban areas to rural areas. The rural rebound refers to the movement away from cities to rural and suburban areas. Urbanization tends to occur along with modernization, yet in the most developed countries many cities are now beginning to lose population. In the United States in the 1970s, demographers observed that the rural population was actually growing faster than urban populations, a phenomenon they labeled the “rural rebound. ” This trend reversed in the 1980s, due in part to a recession that hit farmers particularly hard. But again in the 1990s, rural populations appeared to be gaining at the expense of cities. Indeed, in the last 50 years, about 370 cities worldwide with more than 100,000 residents have undergone population losses of more than 10%, and more than 25% of the depopulating cities are in the United States. Rather than moving to rural areas, most participants in the so-called the rural rebound migrated into new, rapidly growing suburbs. The rural rebound, then, may be more evidence of the importance of suburbanization as a new urban form in the most developed countries. Suburbanization is a general term that refers to the movement of people from cities to surrounding areas. However, the suburbanization that took place after 1970 was different from the suburbanization that had occurred earlier, after World War II. In this more recent wave of suburbanization, people moved beyond the nearby suburbs to farther-away towns. Sociologists have invented several new categories to describe these new types of suburban towns; two of the most notable are ex-urbs and edge cities. The expression exurb (for “extra-urban”) refers to a ring of prosperous communities beyond a city’s suburbs. Often, these communities are commuter towns or bedroom communities. Commuter towns are primarily residential; most of the residents commute to jobs in the city. They are sometimes called bedroom communities because residents spend their days away in the cities and only come home to sleep. In general, commuter towns have little commercial or industrial activity of their own, though they may contain some retail centers to serve the daily needs of residents. Although most exurbs are commuter towns, most commuter towns are not exurban. Exurbs vary in wealth and education level. In the United States, exurban areas typically have much higher college education levels than closer-in suburbs, though this is not necessarily the case in other countries. They typically have average incomes much higher than nearby rural counties, reflecting the urban wages of their residents. Although some exurbs are quite wealthy even compared to nearer suburbs or the city itself, others have higher poverty levels than suburbs nearer the city. This may happen especially where commuter towns form because workers in a region cannot afford to live where they work and must seek residency in another town with a lower cost of living. For example, during the “dot com” bubble of the late twentieth century, housing prices in California cities skyrocketed, spawning exurban growth in adjacent counties. Sociologists have posited many explanations for counterurbanization, but one of the most debated is whether suburbanization is driven by white flight. The term white flight was coined in the mid-twentieth century to describe suburbanization and the large-scale migration of whites of various European ancestries, from racially mixed urban regions to more racially homogeneous suburban regions. During the first half of the twentieth century, discriminatory housing policies often prevented blacks from moving to suburbs; banks and federal policy made it difficult for blacks to get the mortgages they needed to buy houses, and communities used restrictive housing covenants to exclude minorities. White flight during this period contributed to urban decay, a process whereby a city, or part of a city, falls into disrepair and decrepitude. Symptoms of urban decay include depopulation, abandoned buildings, high unemployment, crime, and a desolate, inhospitable landscape. White flight contributed to the draining of cities’ tax bases when middle-class people left, exacerbating urban decay caused in part by the loss of industrial and manufacturing jobs as they moved into rural areas or overseas where labor was cheaper. More recently, the concept has been extended to newer forms of suburbanization, including migration from urban to rural areas and to exurbs. In a similar vein, some demographers have described the rural rebound, and the newest waves of suburbanization, as a form of ethnic balkanization, in which different ethnic groups (not only whites) sort themselves into racially homogeneous communities. These phenomena, however, are not so clearly driven by the restrictive policies, laws, and practices that drove the white flight of the first half of the century. 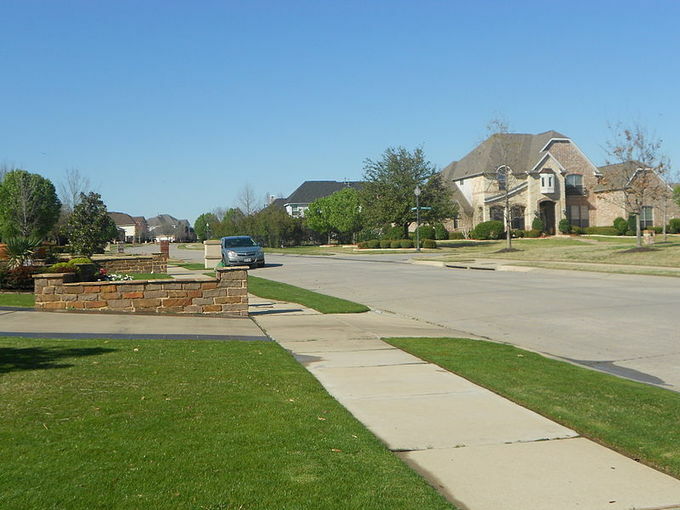 A Suburban Neighborhood: Suburban neighborhoods often feature large, manicured lawns.